Drama. Power Financial Corporation is an investment management company with controlling interests in the public companies IGM Financial Incorporated and Great-West Lifeco Incorporated and a major stake in the Swiss-based Pargesa Holding SA which has diverse investment interests including such fabled industrial companies as Total SA (oil and gas), Suez SA (energy, water and environmental waste services), Imersys SA (specialty minerals mining and processing) and the Lafarge Group (cement and building materials). 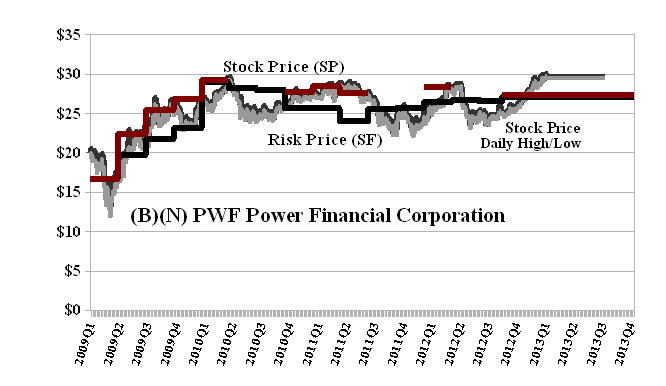 At another level of management and ownership complexity, Power Financial Corporation is itself controlled by another public company, Power Corporation, which has a large and controlling private interest, and one would think that the quadrumvirate of money, motive, power and leverage would be an ideal investment management and ownership structure and opportunity that any investor would like to have. In size, the company is similar to Berkshire Hathaway Incorporated which has about $400 billion in total assets and a net worth of $165 billion (2:1 leverage) whereas the Power Financial Corporation asserts total assets of about $264 billion and a net worth of merely $14 billion or nearly 20:1 leverage. The company is in the news today because it missed on analysts’ expectations of $0.58 per share on earnings and turned in only $0.52 per share in the last quarter (Reuters, March 13, 2013, Power Financial profit falls, misses expectation). The usual investor “alarm” or “misgivings”, we suppose, resulted in volumes of nearly 2 million shares and a price drop of nearly $1 (3%) to $28.40 in contrast to the usual daily volumes of 200,000 to 500,000 shares, although quite a lot changed hands a month ago (in mid-February) at $29.50 or so. The company pays a quarterly dividend of $0.35 per share or nearly $1 billion per year to its shareholders for an attractive yield of 4.9% but not too much should be expected of its stock price (please see Exhibit 1 below) unless the companies that it owns or controls also do very well. We would also think that a drop in the dividend rate – real or anticipated – would tend to cause a sell-off in the non-controlling block and purchases at lower prices (if they have money) by the controlling block or blocks. The company is presently trading at well above its Risk Price (SF) of $27 (please see Exhibit 1 below) and has an estimated downside volatility in the stock price of minus ($1.50). The July put at $28 costs $0.95 per share today and can be partially offset by a sold or short call at $30 for $0.30 per share so that for a net cost of $28 to $29 (or less) for the stock and $0.65 ($0.95 less $0.30) for the collar, we can buy the stock, buy the collar, collect our dividends, and not worry about the stock price for the next four months. Of course, that’s not really much of a deal when one considers portfolios such as The Canada Pension Bond™ (our Post, February 2013) or The Risk Adjusted Dow (March 2013) or The Wall Street Put™ (March 2013) which have already done more (and it’s only mid-March) and can’t do less with our usual policies of risk aversion. Power Financial Corporation is a diversified management and holding company with interests in financial services in North America. IGM Financial Incorporated provides personal financial services and operates as a manager and distributor of mutual funds and other managed asset products. The total assets are $12 billion and the net worth is $4.5 billion. Great-West Lifeco Incorporated is an international financial services holding company with interests in life insurance, health insurance, retirement and investment services, asset management and reinsurance businesses. It has total assets of $254 billion and a net worth of $15 billion.